"Is that horse for sale?" 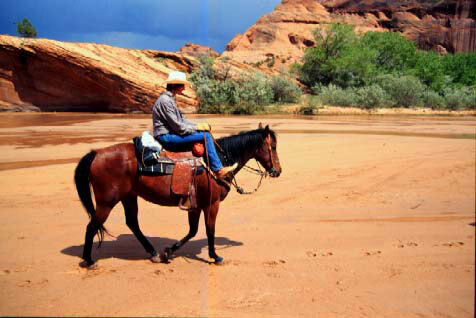 No, Tadadin, the beautiful buckskin mare that belongs to my riding partner Joyce Fay, is not for sale. But she's a horse that gets noticed. Figure 1: The beautiful buckskin -- head view only, sorry. Photo courtesy Joyce Fay. You can get better views of her buckskin from Joyce Fay's photographs cover photographs for New Mexico magazine. 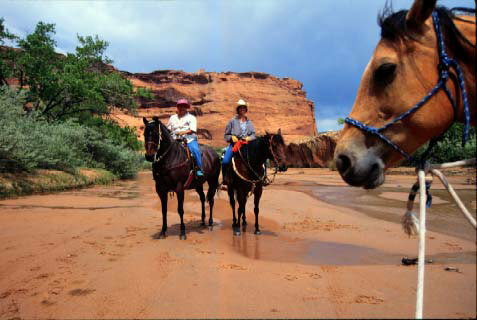 Joyce and I trailered our horses one weekend in May to the Four Corners area so we could ride through Canyon de Chelly. Figure 2. Amy Marash on her gelding, Pokey. Photo courtesy Joyce Fay. We rode on a warm sunny Sunday. Under the towering red rocks we comfortably shared the sand flats with four wheel drive cruisers filled with tourists, and plenty of pick-up trucks splashing the locals through the creek. There are petroglyphs and ruins in the canyon, and a rest area with picnic tables and bathroom facilities. Vicki asked whether we had any money for fry bread, and I gleefully announced that I was buying. But there was none for sale that day, and we picnicked instead on treats from our saddle bags. Later, when I heard a tinkling sound in the wind, I decided there must be a table nearby with someone selling wind chimes. Vicki and Joyce waited until I could finally see the source of the music before laughing out loud. Not windchimes, but sheep with their bells. We endured a little bit of rain, some wind, and one swarm of gnats and mosquitoes, but the ride was exceptionally pleasant. We rode past a small herd of horses with their foals who allowed us through their territory without incident. One yearling was very curious about us, and parked himself at my leg while I stopped to enjoy the view.